Busy, busy, busy. Things are calmer now but it has been quite a ride. Fires. Smoke. Fall finals week postponed to January. Debris slides. Freeway closures. A nine-week Winter quarter. On the positive side, we managed in the midst of all this to complete the installation and furnishing of our new Digital image lab, including an interactive projector and other technology, which is now very actively being used for lectures, seminars and workshops. A launch for the DIL, and for our department’s new archaeological mock trench, will be held on June 9. During the abbreviated Winter quarter, we conducted a search for an Assistant Professor in the Arts of the Ancient and/or Colonial Americas; stay tuned to this channel for further announcements! Starting in Winter 2018, HAA inaugurated a series of invitational courses for undergraduates, with the goal of attracting more majors and minors to the department. The first two courses in the series were in Winter quarter: an invitationallecture class offered by Prof. Jenni Sorkin (Curating Contemporary Art), which brought curators of contemporary art up from Los Angeles to talk with students, and an invitational seminar by Visiting Assistant Prof. Amy Buono (Pacific Standard Time 2 LA/LA), who repeatedly took our students down to meet with the curators of major exhibitions in the Getty’s second iteration of Pacific Standard Time. PST2 LA/LA made its presence known to HAA in other ways as well. Graduate students Diva Zumaya and Margaret Bell co-curated a superb PST2 LA/LA exhibition, “Sacred Art in the Age of Contact: Chumash and Latin American Traditions in Santa Barbara,” which was jointly held at UCSB’s Art, Design & Architecture Museum and the Santa Barbara Historical Museum from Sep. 15, 2017-Jan. 14, 2018. The exhibition explored the relationship of art and spirituality dating from the period of first contact between the Chumash and Spanish, c. 1769-1824. And on January 17, HAA hosted Prof. Elena Shtromberg (University of Utah) for a screening of “Defiant Bodies,” a module from the PST2 LA/LA exhibition “Latin American Video Art,” our first ever screening in the Arts Building courtyard. This year’s HAA lecture series, adroitly organized by Prof. Claudia Moser, is on “The Senses.” Our first two speakers were Prof. Christina Normore (Northwestern University), who spoke deliciously about “Cultivating Taste at the Late Medieval Court,” and Prof. Suzanne Hudson (University of Southern California),” who gave a touching lecture entitled “Happy Accidents” about the TV painting personality Bob Ross. 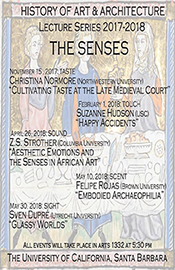 The upcoming speakers in the series are Prof. Zoë Strothers (Columbia University), who will sound off about “Aesthetic Emotions and the Senses in African Art” on April 26; Prof. Felipe Rojas (Brown University), providing us a whiff of “Embodied Archaeophilia” on May 10; and Prof. Sven Dupré (Utrecht University), who casts his eyes on “Glassy Worlds” on May 30. The annual College Art Association conference was conveniently close by in Los Angeles this year, resulting in a banner year for UCSB involvement. Among the UCSB participants were Prof. Heather Badamo, whose paper discussed “Devotional Graffiti: Writing, Re-Enactment and the Production of East Christian Sacred Spaces; Prof. Jenni Sorkin, who delivered not one but two papers, “Prime Objects: New Methodologies in Digital Clay” and “The Work Cure: Craft and Convalescence”; Prof. Peter Sturman, who chaired a session on “Calligraphy’s Visuality in China”; Emerita Prof. Jeanette Peterson, who chaired a session on “Mobilities: Brazil and Beyond,” in which Visiting Assistant Prof. Amy Buono delivered a talk on “Shifting Perspectives in Ancient Amazonian Art: Marajó Funerary Urns”; graduate student Mallory Baskett, whose paper addressed “Performance, Protest and Legacy: The Hampton University Folkore Pageant”; Prof. Mark A. Meadow and graduate student Marta Faust, who co-chaired a double session on “Eccentric Images in the Early Modern World,” in which Marta also delivered a paper titled “’Eyed Awry’: Blind Spots and Apparitions in the Zimmern Anamorphosis”; Ph.D. alumna Staci Gem Scheiwiller, who presented a paper on “Imperium Camera: How Photography Revolutionized Islamicate Empires in the Nineteenth Century”; and Ph.D. alumnus Bret Rothstein who spoke about “Puzzles, Pedagogy, and the Limits of Description in Luca Pacioli’s ‘De viribus quantitates.’” Graduate student Mary Okin organized a stunningly successful book sale for the Art History Graduate Student Association, which raised enough funds to cover the registration costs for all of the UCSB graduate students attending CAA; special thanks to Peter Sturman, Elyse Gonzales, Bruce Robertson, Volker Welter and everyone else who contributed to this effort. 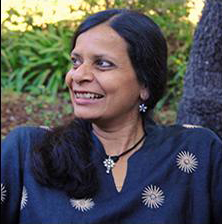 Last but by no means least, on behalf of the department, I would especially like to congratulate Prof. Swati Chattopadhyay on being appointed as a Fellow of the Society of Architectural Historians. Already a signal honor, what makes this truly exceptional is that Prof. Chattopadhyay is the youngest scholar ever to be inducted as a fellow, which is evidence of the extraordinary impact that she has had on the field as a scholar, a teacher and as editor of the Journal of the Society of Architectural Historians. Brava, Swati! Prof. Swati Chattopadhyay will be inducted as a Society of Architectural Historians Fellow at the Society’s 71st Annual International Conference Awards Ceremony on April 20, in Saint Paul, MN. SAH Fellows are individuals who have distinguished themselves by a lifetime of significant contributions to the field of architectural history, which may include scholarship, service to SAH or stewardship of the built environment. Read more about the 2018 Fellows here. Visiting Assistant Professor Amy Buono (Ph.D. 2007) (back row, second from left) leads her 187Z Pacfic Standard Time2: LA/LA seminar to the Dreams and Revelations: Afro-Brazilian Art and Identities exhibition at the Channing Peake Gallery in Santa Barbara. The exhibition was curated by Paulo P. Lima (back row, center). Prof. Mark Meadow (center) tagged along. Prof. Mark A. Meadow published an essay on “A Curated Collection: Virtuosity and Performance in the Paston Treasure,” in Moore, A, N. Flis and F. Vanke, eds, The Paston Treasure: Microcosm of the Known World, Yale University Press, 2018, 112-119. On November 8, 2017, Mark delivered a lecture on “Prudently Abandoning Wonder: On Changing the Governing Concept of the Kunstkammer” for the Bard Graduate Center’s Seminar in Renaissance and Early Modern Material Culture. Together with graduate student Marta Faust, Mark co-chaired a double session on “Eccentric Images in the Early Modern World” at the 2018 College Art Association Conference in Los Angeles. In fall 2017, Prof. Jenni Sorkin gave keynote talks at two different graduate symposia: "Working on It...Preparation in Art" at USC's Art History Grad Symposium, and "Long Shadows: Tradition, Influence and Persistence in Modern Craft" at the Yale Center for British Art Annual Graduate Symposium. Additionally, she gave invited talks as a visiting critic at Southern Methodist University, Rhode Island School of Design, and the University of Oregon. She also published a major essay, titled "Affinities in Abstraction: Textiles, Otherness and Painting in the 1970s," in the exhibition catalog for Outliers and American Vanguard Art, curated by Lynne Cooke, which runs at the National Gallery of Art, Washington D.C. from January 28 through May 13, 2018. The New York-based magazine Cabinet: A Quarterly of Art & Culture published (August 2017) Prof. Volker Welter’s research on the previously unidentified Los Angeles home of German film director F.W. Murnau, best known today for the silent movie classic Nosferatu: A Symphony of Horror (1922). In October, Palm Spring’s Modernism Week Fall Preview featured a lecture by Prof. Welter on Palm Desert architect Walter S. White in conjunction with the Historical Society of Palm Desert’s efforts to preserve the Miles C. Bates House and its unique, wave-like wooden roof. 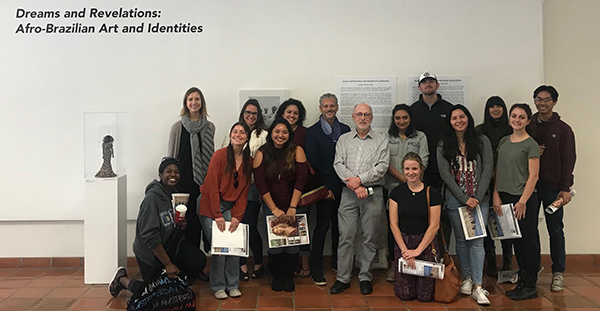 At the Humanities in the Community: 2017 Convention of the Western Humanities Alliance, hosted by UCSB’s Interdisciplinary Humanities Center in November, Prof. Welter read a paper that reflected on the attempt by citizens of Palm Desert to preserve the Bates House as one surprising outcome initiated by the Art, Design, and Architecture Museum’s Fall 2015 exhibition on Walter S. White. Aleesa Alexander was invited by the Harvard Art Museums to perform primary research on the David and Didi Barrett Collection of self-taught and outsider art. She is presenting her findings in a public lecture, "Those Who Remained: Southern Black Art from the Barrett Collection," and leading an Art Study Seminar at the Museum (Feb 21-23 2018). She also presented her paper, "Lonnie Holley's Trash Lessons," at the 10th Annual Southern Studies Conference in Montgomery, Alabama (Feb. 9-10, 2018), and contributed entries to the catalog for the exhibition "Odyssey: Jack Whitten Sculpture, 1963-2016," opening at the Baltimore Museum of Art in April 2018, and traveling to The Metropolitan Museum of Art. Laura Dizerega gave two talks last year. The first, “Church and State: Karl Friedrich Schinkel and Early Nineteenth-Century Debates Surrounding Provincial Church Design,” at Theorie und Geschichte der Architektur, Inaugural Doctoral Colloquium of the Center for Critical Studies in Architectural (CCSA), a collaboration of the Deutsches Architektur Museum, the Department of Art History at the Goethe-Universität Frankfurt, and the Department of Architectural History at the Technical Universität Darmstadt, November 30 — December 1, 2017. The second, “Johann Claudius von Lassaulx, Karl Friedrich Schinkel, and the Twenty-Year Struggle for a New Parish Church at Vallendar,” at Autodidakt, Werkstatt und Akademie: Architektenausbildung 1400-1850, 6th Colloquium on Architectural Theory at the Werner Oechslin Library, Einsiedeln, Switzerland, April 20-23, 2017. She is also organizing the official alumni panel of the Berlin Program Fellowship of the Freie Universität,l to be held at the 2018 German Studies Association meeting in Pittsburgh, PA, September 27-30. The panel is entitled "State Building as a Cultural Act: Intersections Between Bureaucracy and Art and Architectural Production in German Regimes, 1815-1989." Holly Gore has been awarded a Craft Research Fund Project Grant from the Center for Craft, Creativity & Design in support of her dissertation, “Reinventing Work: Modernist Wood and Skilled Trade, 1940—1970.” She presented her work at the Yale Graduate Symposium, “Long Shadows: Tradition, Influence, and Persistence in Modern Craft.” Her exhibition, “Crafting Abstraction,” which she curated while a Windgate Curatorial Intern at the Asheville Art Museum this past fall, opens at the Museum in March. Suzanne van de Meerendonk published an article on paintings by Theodoor van Thulden (1606-1669) in the Bois-le-Duc Town Hall, which appeared in the inaugural volume of the peer-reviewed open access e-journal Early Modern Low Countries, successor to the Dutch language journal De Zeventiende Eeuw. Suzanne also contributed an essay to a thematic issue of Noticias, Journal of the Santa Barbara Historical Museum, edited by HAA graduate students Diva Zumaya and Margaret Bell, which appeared in conjunction with the exhibition Sacred Art in the Age of Contact: Chumash and Latin American Traditions in Santa Barbara (Santa Barbara Historical Museum and AD&A Museum, Santa Barbara). Sophia Quach McCabe has received the 2018-2019 Getty Graduate Internship in the Project for the Study of Collecting and Provenance Department at the Getty Research Institute. Erin Travers was invited to give lectures on the relationship between art and anatomy in the seventeenth-century Netherlands at the Universiteit van Amsterdam, Universiteit Utrecht, Rijksuniversiteit Groningen, and Sam Houston State University in 2017. During the fall term, she also served on the Editorial Board for the Journal of the LUCAS Graduate Conference, producing the volume Landscape: Interpretations, Relations, and Representations. Diva Zumaya received a "Travel Grant Fellowship for Emerging Curators from Pacific Standard Time: LA/:LA Exhibitions" from the Association of Art Museum Curators (AAMC) to attend their annual conference in Montreal in May. Sunnylands: America’s Midcentury Masterpiece (Vendome Press, 2016), by Janice Lyle. Liminalities of Gender and Sexuality in Nineteenth-Century Iranian Photography: Desirous Bodies (Routledge, 2017), by Staci Gem Scheiwiller. Funding Your Research in the Humanities and Social Sciences (Routledge, 2018), by Holly Unruh. Cynthia Canejo, (Ph.D. 2005), Associate Professor, Department of Art and Art History at the University of North Carolina at Asheville, has published articles in both her areas of specialization. In Medieval architecture: “Practical Demands and Experimentation: Fabricating the Gothic Hemicycle Arch” Peregrinations: Journal of Medieval Art and Architecture, 5.4 (2016): 1-40. In Latin American art: "Chicano Art and Beyond: John Valadez and the Effects of Montage," Delaware Review of Latin American Studies 17.3 (2016): 1-14. Cristina Carbone (Ph.D. 2001) and her team of scholars, including Benjamin Hufbauer (Ph.D. 1999), have published entries on Kentucky’s 100 Classic Buildings for SAH Archipedia. This Society of Architectural Historians initiative is sponsored by a National Endowment for the Humanities We The People Grant, the goal of which is to make scholarly essays available to the general public, and is published by the University of Virginia Press. George Flaherty’s (Ph.D. 2011) first book, Hotel Mexico: Dwelling on the ’68 Movement (University of California Press, 2016), was awarded the Association for Latin American Art’s Arvey Book Prize for 2017. Also, a trilingual dossier of articles co-edited and with an introduction by Flaherty and Andrea Giunta (Universidad de Buenos Aires), with the theme “Exhibitions as Fields of Comparison,” was published in December by CAIANA, the open-access journal of the Centro Argentino de Investigadores de Arte. Charlene G. Garfinkle (Ph.D. 1996) has published the article, “’Becoming Visible’ Revisited: The Coming Woman, Seal of Boston, and Women of Chelsea Stained Glass Windows from the 1893 Woman’s Building,” Stained Glass, Vol. 112, No. 4 (Winter 2017). Daniel Chak Kwong Lau (Ph.D. 2006) received a research grant through the Research Grants Council of Hong Kong for his next project, "Social and Cultural Implications of Chinese Calligraphy in Public Venues in Hong Kong." Heather Marx (MA 1994) curated the exhibition Altered States at the Bedford Gallery, Lesher Center for the Arts, Walnut Creek, CA (January 13-March 25, 2019). The exhibit will feature a cross generation of contemporary artists from Northern and Southern California who harness natural elements or the environment to create their artwork. Site specific works in a variety of media will be on view. Janice Lyle (MA 1978, Ph.D. 1984), Director of Sunnylands Center & Gardens, presented twelve talks in 2017, from San Francisco to London, related to her book Sunnylands: America’s Midcentury Masterpiece (Vendome Press, 2016). Jessica Tade (Ph.D. 2010) is the executive director of Casa del Herrero, a historic house museum and gardens located in Montecito, California. In this role, she oversees all aspects of operations including stewardship of the estate and preservation of the fifteenth and sixteenth-century fine and decorative arts collection. In 2017, Jessica was awarded the Pacific Coast Business Times “40 Under 40” award. Additionally, she was recently appointed to the Santa Barbara County Historic Landmarks Advisory Commission. Holly Unruh (Ph.D. 2003) co-authored Funding Your Research in the Humanities and Social Sciences (Routledge, 2018), a guide to writing grand and fellowship proposals. Wencheng Yan (Ph.D. 2016) received the Society of Architectural Historians' Field Seminar Fellowship for the 10-day China tour in December 2017. You can read her field report here. Dear Alumni: please send your news of appointments, awards and other achievements to meadow at arthistory.ucsb.edu and spafford at hfa.ucsb.edu.